Through Dr. Dayton's insightful analysis and thoughtful examination, Adult Children of Alcoholics will learn how and why the pain they experienced in childhood plays out in their adult partnering and parenting, and they will learn how to restore health and happiness through their resilience. The psychological rule says that when an inner situation is not made conscious, it happens outside, as fate. That is to say, when the individual . . . does not become conscious of his inner opposite, the world must perforce act out the conflict and be torn into opposing halves. My father had two very distinct personalities. The same father who tenderly gave me café au lait on a spoon and fresh-squeezed orange juice in a baby glass, who listened to my childish sentences with such pride and pleasure, who dreamed impossible dreams for my future and worked all of his life to give me the best of everything—that same beloved father had a monster living inside of him. And that monster was as frightening to me as the other side of him was beautiful. And that monster grew stronger with each drink he took. At different times of the month, the week, and eventually the day, the monster would take over my father, and I would have no idea where my 'real' dad had gone. Now and then, the monster in him would break loose and dance with the monster in all of us. The monster roared its terrible roar and sat in my father's chair in the living room. And I was, somehow, this monster's child. We each, at one time or another, shared his private hell with him until all of us lost our grip on normal. But still, this was my family, my dad, my monster, and I had to do something to make emotional and psychological sense of living with a parent who made me feel both safe and terrified; a parent whom I loved and hated all at once. All children are faced with integrating parts of their parents that they both love and hate, but for the child in the alcoholic home, this becomes a uniquely challenging and daily experience. When Dad went to (and left) treatment, there was no such thing as family healing. The wisdom of the day was essentially 'get the alcoholic sober and the rest of the family will get better automatically.' But that didn't happen. It didn't happen because the de-selfing experience of living on an emotional roller coaster had left us not knowing what normal life felt like. The healthy boundary that once surrounded the sweet and secure membrane of our lives was invaded and degraded by the disease of addiction. Just as we had a drunken father and a sober one, we had a drunken family and a sober one. It was as if we repeatedly passed behind some invisible curtain, reemerging each time into an alternate universe but still in our same, familiar living room. The scenes looked somewhat the same, but they felt different. Just maneuvering in and through these worlds required creative, complex, zany, and sometimes rather dysfunctional strategies. We had no idea, in the 1960s, of how deeply affected an entire family becomes, how the trauma of living with the daily disruptions, distortions, and denial of addiction wraps its tentacles around childhood development and family development, changing everyone. But it doesn't have to be that way. Today we have something called recovery. Today we recognize that there is no dignity in hiding the truth and no freedom in keeping secrets. We learn, in recovery, to stand up and take responsibility for the part of the disease that lives in us and to take the necessary steps to treat it. And in doing this, we restore our hope, faith, and trust in life. It is impossible to explain to someone who has not been through it how many little things go awry in a home where addiction has taken hold. Sure, I can say routines were thrown off; there was constant crisis that wasn't there before, but that doesn't fully describe it. What really hurts is that you can no longer count on anyone the way that you once did. You watch the parent you love turn the face that once smiled at you towards a bottle of alcohol or sink into a lying and degrading behavior. And then, just as mysteriously, he returns, clean-shaven, loving you once again, and remembering all the things you worried he had forgotten--that you're in a school play, what you like for breakfast, that you are still there (even though he comes and goes). You have him back. You're torn between letting it feel wonderful (which it does) and not letting it feel too good, because you know from experience that if it feels too good it will only hurt more when he slips away again. Then sure enough, you sense tension creeping in, you see situations devolving and unraveling before your eyes, and you know that it's coming. You can read all the signs. The gap between the worlds that had temporarily closed up begins to widen, and your addict disappears into some crevice, some wormhole in the universe, and he is gone as mysteriously as he came. He returns to his private nowhere where you can't find him. He hides in plain sight. And you have to lose him once again. And wait to see what happens. And just be in the family that is still there. Somewhat there. You see the disappointment on the faces around you; you see the confusion, the humiliation and the hurt. And simultaneously you see those family members shake their heads, square their shoulders, and mush on because the world is still chugging along even though the alcoholic has stepped off. You both appreciate and hate their efforts. You appreciate the ones who are able to plow through, even with blinders, because someone has to, because there are school buses to make, homework to be done, and appointments to get to. You hate it because you sense the sham underneath it. The pain inside you, inside everyone grows. But no one talks about it; because what would they say? It is too sad to look at, too much to sort out. The Japanese said it most succinctly: 'First the man takes the drink, then the drink takes the drink, then the drink takes the man.' And I would add that then the drink or disease takes the family. This disease is contagious. It's not only the addict who needs to sober up. Family members, too, need to become emotionally sober. Today, because treatment is so much more common, its progression can be caught before it spreads through the whole family. But the longer a family remains silent, in denial and living in the throes of managing the mind-numbing disease of addiction, the more symptomatic family members are likely to become. Adult children of alcoholics (ACoAs) can and often do suffer from some features of post-traumatic stress disorder (PTSD) that are the direct result of living with the traumatizing effects of addiction. Years after we leave behind our alcoholic homes, we carry the impact of living with addiction with us. We import past, unresolved pain into present-day relationships, but without much awareness as to how or why. And that is what this book is about. How living with addiction or dysfunction creates cumulative trauma, the effects of which can play out over a life time. And what to do to get better. And how getting better will open doors inside of you that you hardly knew were there. Trauma is actually fairly common; most people grow up with at least four adverse childhood experiences (Anda 2006). It is not necessarily the trauma that creates lasting problematic effects, but how we deal with it (or don't deal with it) when it occurs and afterward. Much can be done to ameliorate the effects of adverse childhood experiences. Supportive people, places to go that feel safe, and moving shock into some form of consciousness so pain does not remain hidden and unspoken can take a situation that could be traumatic and turn it into something that might be less damaging and potentially even character building. Our culture creates a sort of myth of 'happily ever after' that is really no one's life. Feeling sad, anxious, or fearful is part of the human condition and does not necessarily require treatment. What makes trauma different from normal life stressors is that its effects tend to be long-lasting and repetitive and the patterns that are associated with a traumatic circumstance make their way through the generations. Our shock is long-lasting, engraved in our neurological systems and evidenced by how easily we can be triggered, how quickly our emotions go from zero to ten. We experience a loss of neuromodulation, which translates into our losing some of our ability to self regulate. Feelings, even intense ones, come and go; but unresolved, hidden and unprocessed trauma can last. Because of the way the brain processes trauma, our most painful experiences may be the very ones that get repressed or thrown out of conscious awareness. While initially this allows us to function during overwhelming experiences that might otherwise immobilize us, eventually those feelings of fear and anxiety need to be felt rather than frozen. The family, while a perfect unit for raising young, can also be fertile ground for creating cumulative trauma throughout the developmental cycle. Our primary relationships are meant to nurture and sustain us until we are strong enough to survive on our own. When small children are terrified by the very same people who they would normally go to for comfort and safety, they become trapped in a confusing and disequilibrating system with no one to help them to restore their sense of 'normal' and their feeling of emotional balance. They are then forced to come up with immature strategies to manage what feels unmanageable. Oftentimes they just go numb. Or they dissociate; they disappear on the inside. Recovery from the ACoA trauma syndrome is all about reclaiming the fragmented parts of self that are trapped in another psychological and emotional time and place and bringing them into the here and now. It is translating hidden emotion into words so that feelings can be processed, new insight and meaning can be gained, and experiences can be knitted back together with new understanding into a coherent and present-oriented picture of the functioning self and the self in relation to others. It is learning to live in the present rather than in the past or future. This field has many pioneers whose remarkable sharing and collaborations over the years have lit a lamp for others to follow. Some of these pioneers are Margaret Cork, Claudia Black, Sharon Wegscheider-Cruse, Robert Ackerman, Jane Middleton-Moz, Stephanie Brown, Don Coyhis, Jerry Moe, Janet Woititz, Rokelle Lerner, Faye Calhoun, Jeannette Johnson, Phil Diaz, Patricia O'Gorman, Frances Brisbane, Stephanie Covington, Anna Whiting Sorrel, Hoover Adger, Lala Strassner, Cathleen Brooks Weiss, Ann Smith, Ellen Morehouse, Patrick Carnes, John Bradshaw, and Timmen Cermak. Research on trauma made my own work come alive and provided a research base that began my own exploration of what I call the ACoA Trauma Syndrome; much gratitude to Bessel van der Kolk, Judith Hermann, and Lisa Najavitts for their seminal work in this area. Another leg of the stool that the syndrome stands on is attachment research, which I apply to my understanding of how childhood development is affected by growing up with addiction. Those in the area of attachment by whom I have been led are Maria Montessori, Jonathon Bowlby, D. W. Winnicott, Alan Schore, Stanley Greenspan, and Daniel Siegel. Robert Anda's research on Adverse Childhood Experiences (ACE) has elevated awareness and brought attention to the long-term impact that growing up with addiction can have on both mental and physical health, making an invaluable contribution toward policy in this area. Psychodrama is my method of treating people who have been traumatized or people simply looking to increase their own level of spontaneity, creativity, and aliveness. In this area I have been most impacted by J. L. Moreno, Zerka Moreno, and Dr. Robert Siroka, whose excellent training and vision for this method lit my own healing spirit. It is my hope that by the end of this book you will have an in-depth understanding of trauma; it is also my hope that reading this book will help to make trauma seem less strange and threatening to cope with and help you to develop various strategies for lifestyles that both minimize its occurrence and intensity and process it before it comes to have a life of its own. In Part 1, we discuss and draw pictures of the black-and-white world of the family system that contains addiction. In Part II, you will learn how your mind and body become affected and infected through living with the trauma-engendering dysfunctional relationship dynamics that surround addiction. In Part III, we explore case studies involving process addictions or the many forms of compulsive behaviors that self-medication can assume. In Part IV, we'll take a step down the path of healing from the ACoA Trauma Syndrome and offer tips on attitude and lifestyle changes that build resilience and strength. In Part V, we'll look at ways of breaking the intergenerational chain of pain. We'll see how the past can be separated from the present so that we can live with mindful, positive purpose in the here and now. ©2012 Tian Dayton, PhD. All rights reserved. 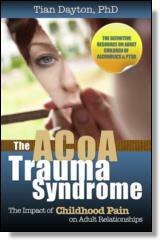 Reprinted from The ACOA Trauma Syndrome. No part of this publication may be reproduced, stored in a retrieval system or transmitted in any form or by any means, without the written permission of the publisher. Publisher: Health Communications, Inc., 3201 SW 15th Street, Deerfield Beach, FL 33442.